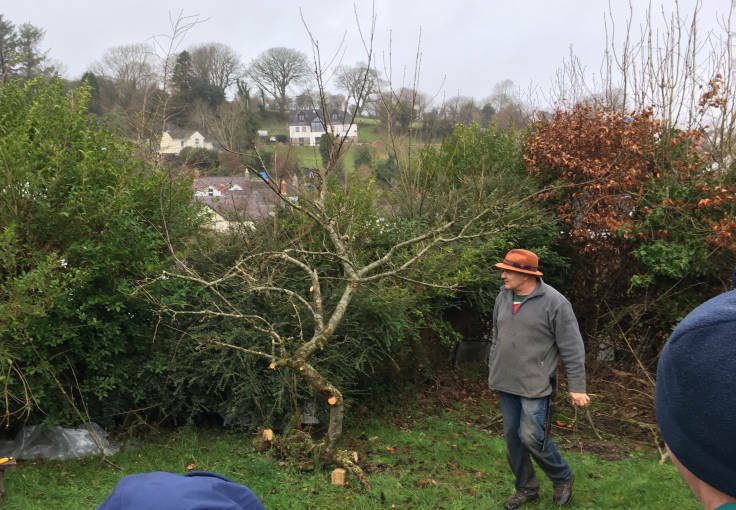 After a pruning workshop with orchardist Martin Hayes, I marvel at the skills and knowledge of professional horticulturalists. The People’s Orchard hosted a fantastically well attended pruning workshop on Saturday 26th January (about 27 people). 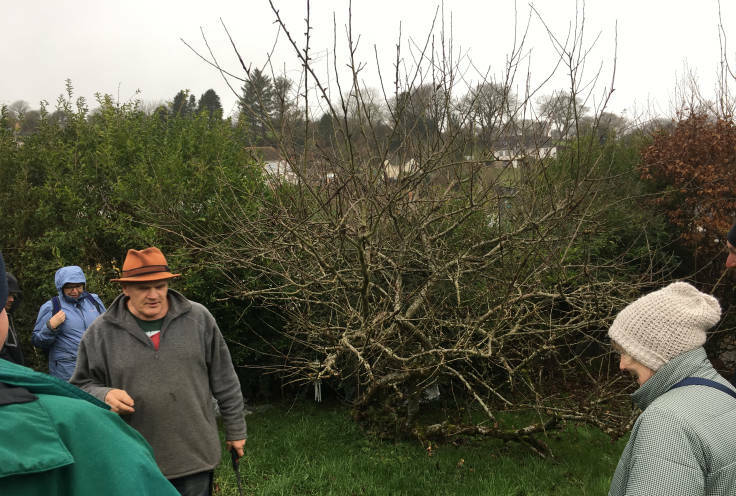 It was led by Martin Hayes, orchardist to the stars, who has about 40 years commercial pruning experience. He has an easy manner about him, and is perfectly happy to run through the basics of pruning with beginners. What is quite amazing is to see him work on a tree, making cuts and giving a running commentary about the principles at play, all the while branches falling for participants to clear. Martin Hayes and the first pruning example of the day. Before. 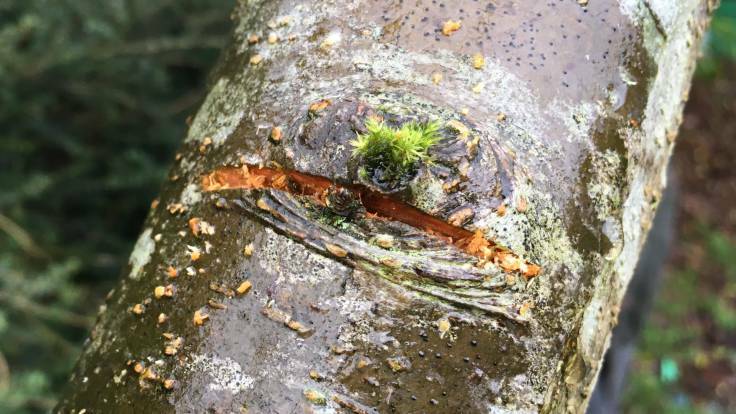 In the photo above, he pointed out how the tree was overcrowded with branches, suffering from canker and had fallen over, so that new branches were growing upward. The apple tree had a lot of canker and had fallen over (note supporting wood block). After. It would take me hours of pontificating and hesitant snipping, and it took him less than 5 minutes, not counting the talking bits. Like Zorro but with secateurs. And without the cape. What is refreshing is that he doesn’t pretend to know everything. At one point, he was discussing how to leave a “sap riser” to direct the tree’s energy up if you don’t you want the growth lower down, and that apparently a scientific study showed beavers leave sap risers on trees that they fell. Someone asked about how coppicing works in that regard, and he said he really didn’t know. One of the handy tips I did learn was about was the “Dutch Cut”, which encourages the growth of a new branch. I’ve noticed in the forest garden quite a few of the trees are lacking branches on the windward side, so I’ll be trying this technique (and improving my windbreaks as well). All in all, if you’re growing any fruit trees, I’d really recommend you attend a pruning workshop. It’ll pay for itself in healthy trees and bountiful fruit harvests.